Well hey, it's the Fourth of July! Happy Birthday America! 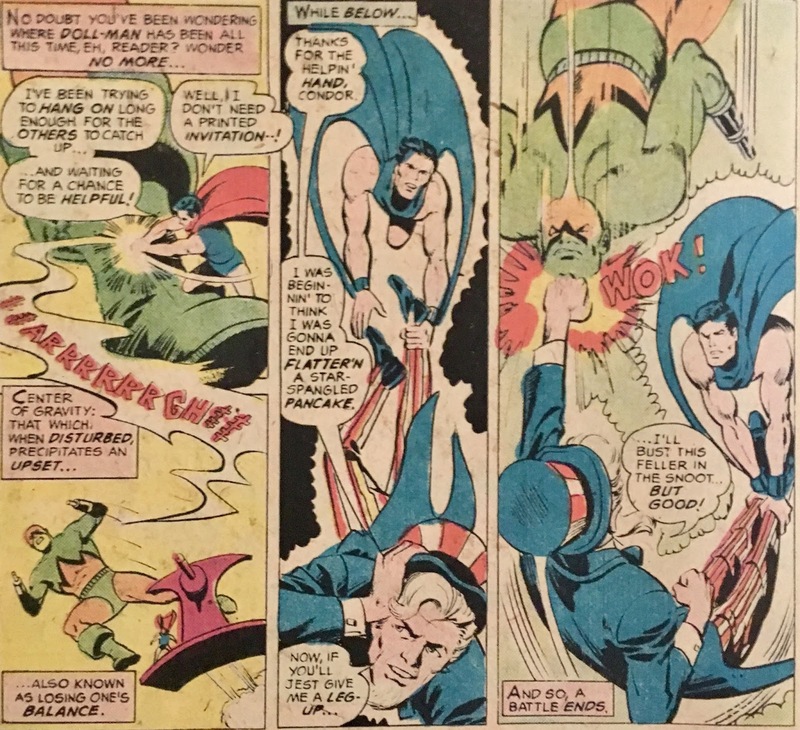 Now, last year we were able to sidestep the whole patriotic angle by discussing, er, a Marvel Comics mutant with powers not unlike fireworks... but this time around we're gonna go full red, white and blue. 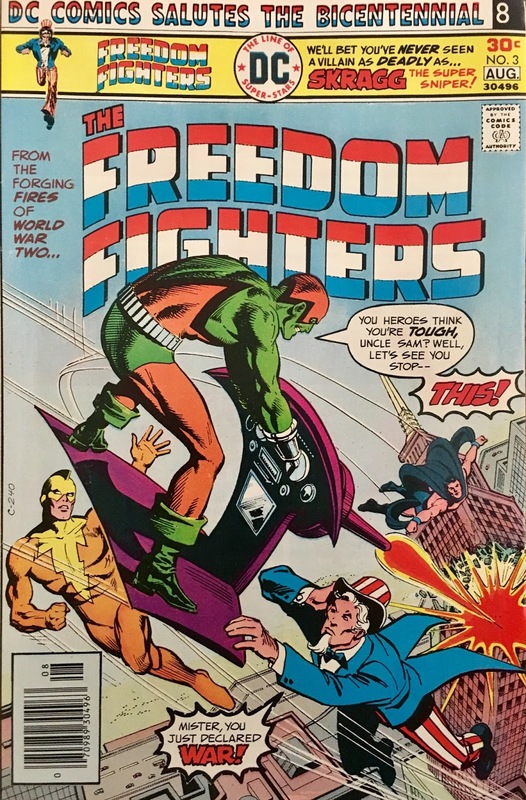 I ask ya, what better way to celebrate the United States of America than by checking out an issue of Freedom Fighters? 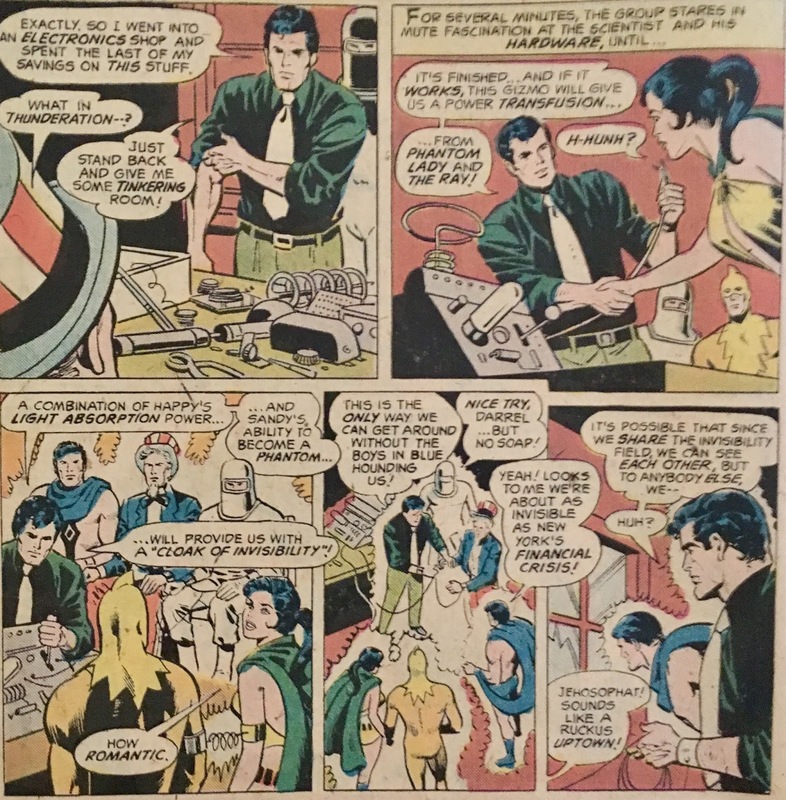 Well, howsabout the DC Comics Bicentennial Month issue of Freedom Fighters? We open with the heroes holed up in a deserted mansion. The police have them surrounded and consider them fugitives from the law... we'll get there. Inside, the Freedom Fighters decide their best course of action to escape the police is... er, escaping the police. Good call, folks! The Ray hurls some light blobs at the police spotlight, and they get away. After they're gone, an officer notices that District Attorney Pearson is there... and the D.A. is to blame for "those freaks" being there. 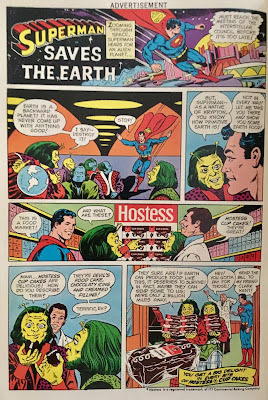 Weird, I thought the FF were on DC Earth (one) right now... why not call in some other super-types to take them down? 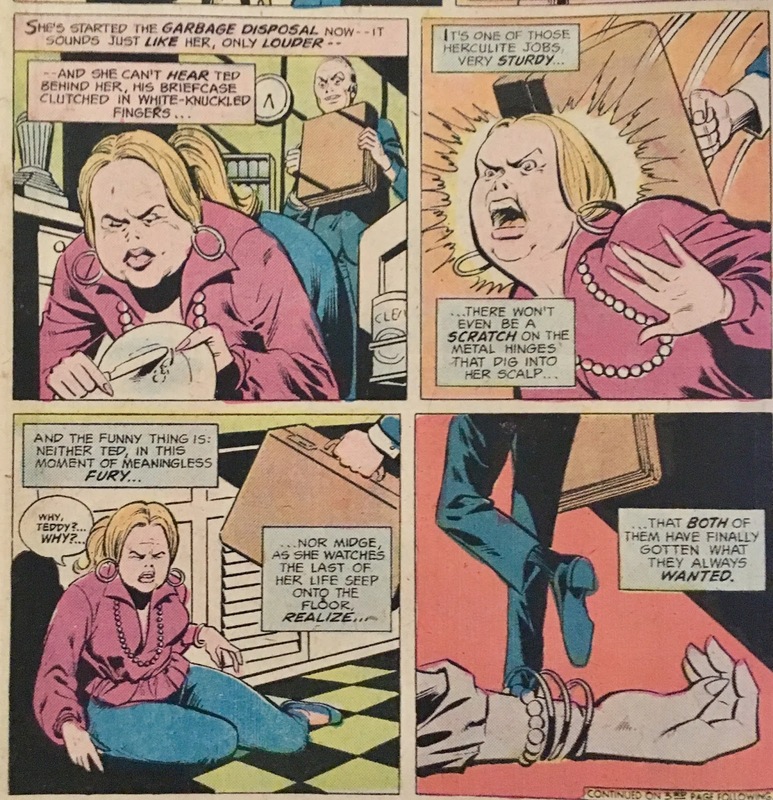 Let's turn the page and meet Mrs. Tart Rumors, who is doing the dishes while humming some grindstep beat box. This upsets Ted... so, he creeps up behind her, and bashes her head in with his briefcase! Must'a been a Halliburton. 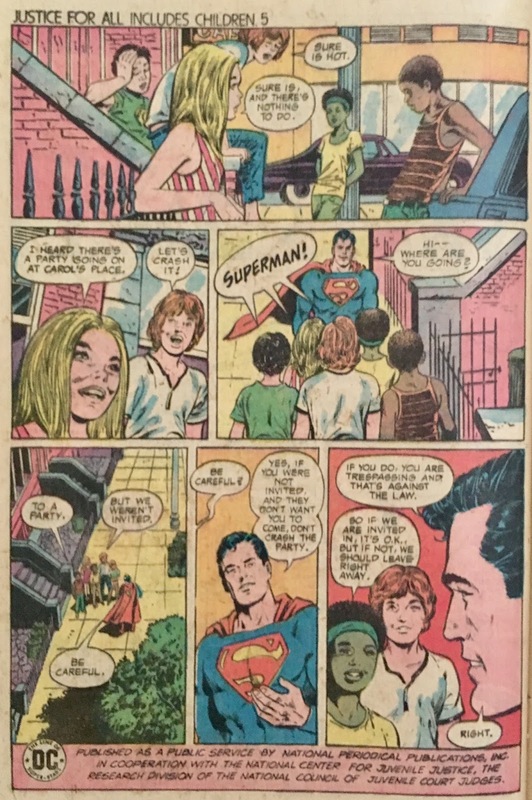 We rejoin the Freedom Fighters, who are now hiding out in an abandoned loft. Uncle Sam questions why they ever left Earth-X... which, I dunno... seems like a silly question. Gotta figure "our" Earth might be a little bit better than one under Hitler's Reich, right? Phantom Lady suggests they just keep their cool and put their heroic alter-egos on the shelf for a bit. 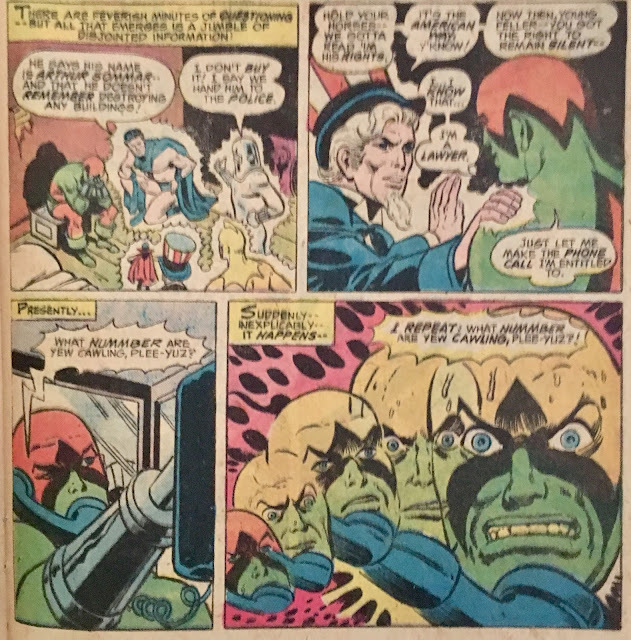 Doll Man's all "not so fast", and (somehow) produces WANTED posters for each member of the FF... in and out of costume! 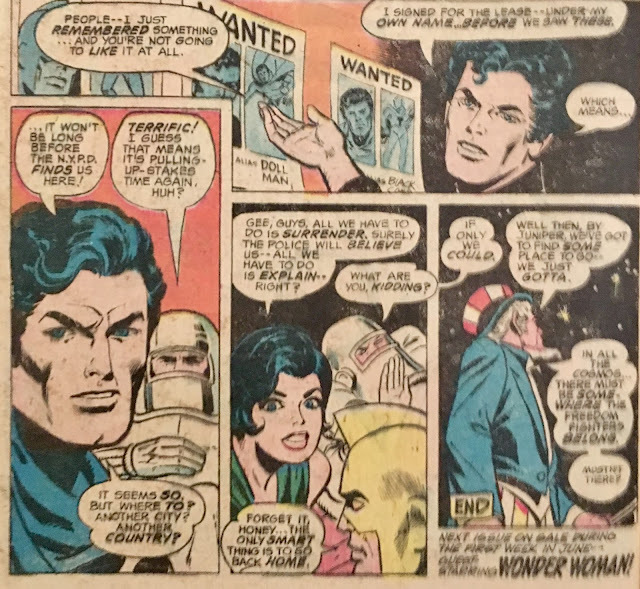 Ya see, they spilled all the beans to that District Attorney Pearson when they arrived on Earth-1. While the team frets, Ray is busy turning scraps of metal garbage into a power transfusion machine. He has a plan which involves he and Phantom Lady use the machine to mix their powers... 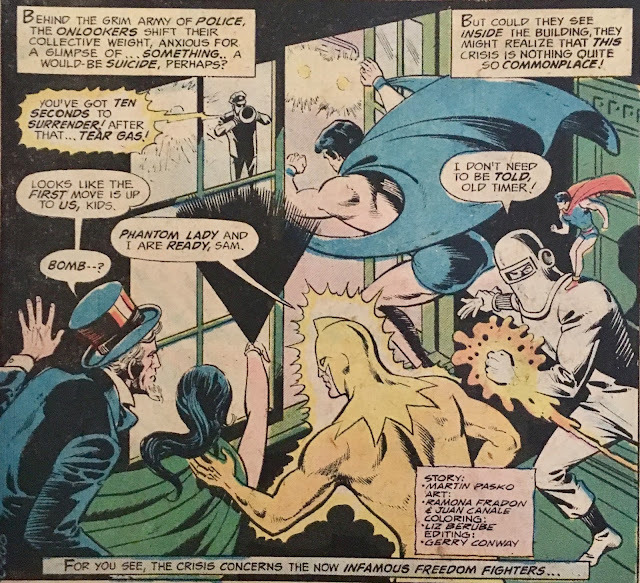 Happy (Ray) can absorb light, and Sandy (Phantom Lady) can, well, become a phantom. With their powers combined, they can cloak the entire team in invisibility. Suuuure, stands to reason... I guess. A-hem. As luck would have it, just as our pals go transparent, some balaclava-clad roller skate-wearing goofballs are robbing a... sporting goods store? 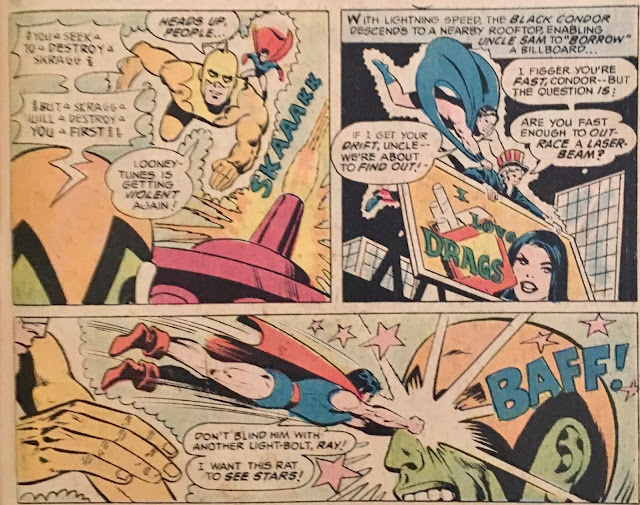 The Freedom Fighters easily take down the geeks... because, ya know, a) they're invisible and b) c'mon look at these bad guys. As the fight winds down, we are joined by our suburban psychopath, Ted! At this point we shift to some Qwardian observers... they are able to see through the Freedom Fighters' invisibility trick. They are displeased to see these colorful creeps spoiling the fun of the "noble thieves", and decide to even the odds by providing them with a "Straser" (strafing laser unit to us plebs). They blast ol' Ted with a beam... which leaves him covered in, I dunno goo, or perhaps frost... anyhoo, he transforms into (the iconic) Skragg, the Super-Sniper! 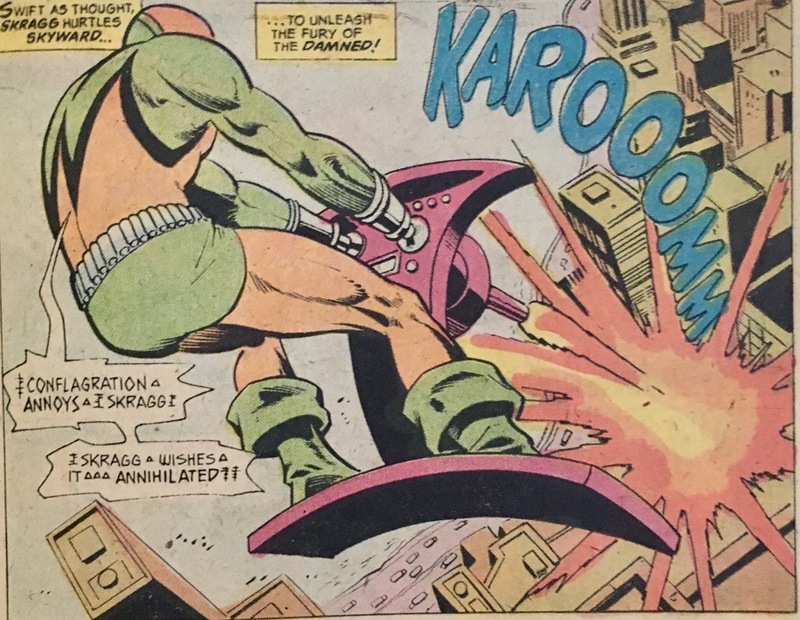 Skragg plugs his arm stumps in and flies upward on his goblin-glider where he begins decimating the New York City skyline. Nearby, Uncle Sam thinks the boomings might be the result of his partner, the Human Bomb... but, nope! The Freedom Fighters head back out to take down this new threat... and do so, pretty easily. 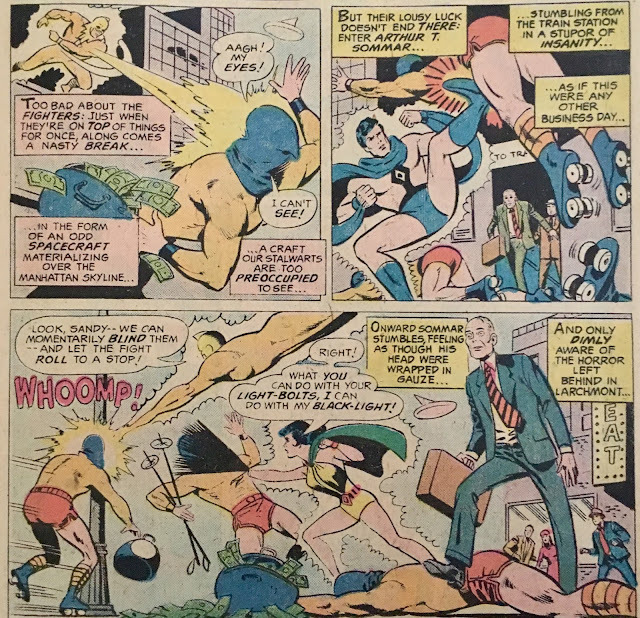 Worth mentioning (I guess) that Phantom Lady has vanished (pun! 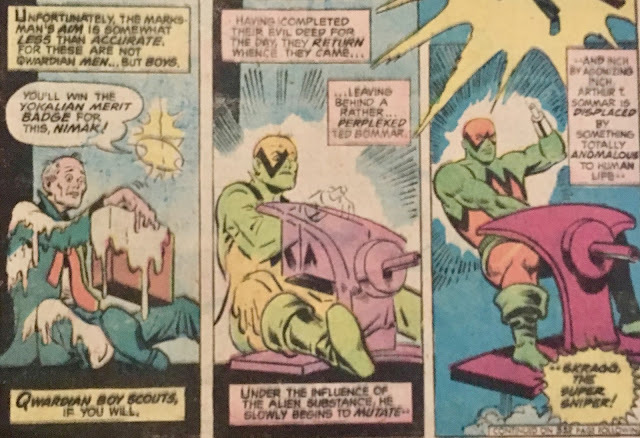 ), as has Doll Man. The remaining Fighters just write them off as being elsewhere together. 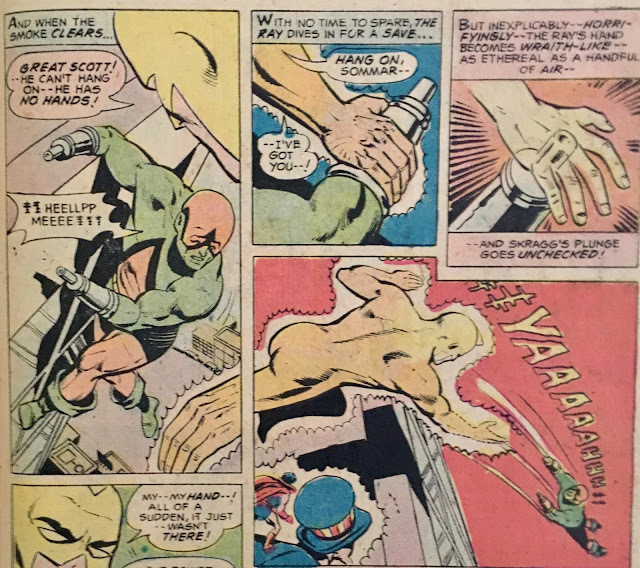 During the fight, however, Doll Man is not only present but instrumental in Skragg's defeat. After being taken into custody, Skragg seems to waver between his Qwardian-effected persona, and his normal (homicidal?) one. He freaks out that he no longer has hands... which, yeah... that sounds like something that would happen. 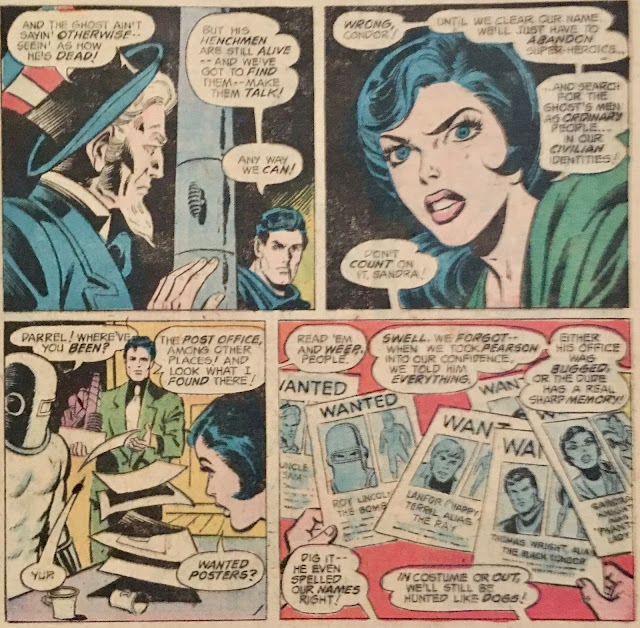 Uncle Sam proceeds to... read him his Miranda rights, welp, wasn't expecting that. Skragg says he knows his rights, because ol' Ted's a lawyer. He requests his phone call... and it's granted. We get a neat panel of him dialing a phone with his wrist-turrets, before he is taken over by psychopathy. Skragg starts blasting with his wrist-blasters, and the fight is back on. It's just another fight... the only thing worth mentioning is Black Condor and Uncle Sam procuring a billboard with a... weird slogan on it. The fight ends with Skragg hanging on to the side of a skyscraper. He begs the FF for help, and Ray attempts to lend a hand... unfortunately, during the act his hand goes all "phantomy", a residual effect of the earlier power transfusion. Skragg falls, presumably to his death. After all, it's been over forty years, and we haven't seen him since. Maybe he's still falling? The issue ends with the gang back at their hideout, listlessly looking at their WANTED posters and wondering what their place in this world is. Oh yeah, Phantom Lady also returns... having been buried under rubble for the second half of the issue, and had to dig herself out. Now, who ever said chivalry is dead? 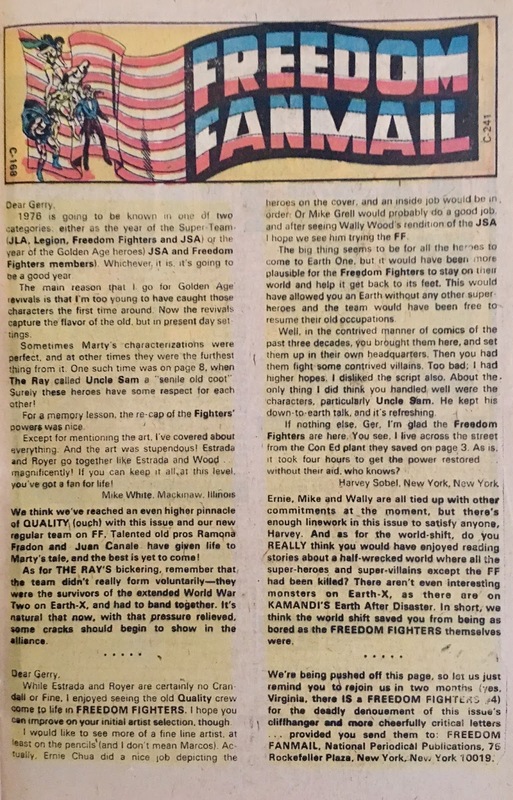 Well... that sure was an issue of Freedom Fighters. It wasn't bad or anything... just kinda boring. It looked nice though! Really not a whole lot to say about this one. 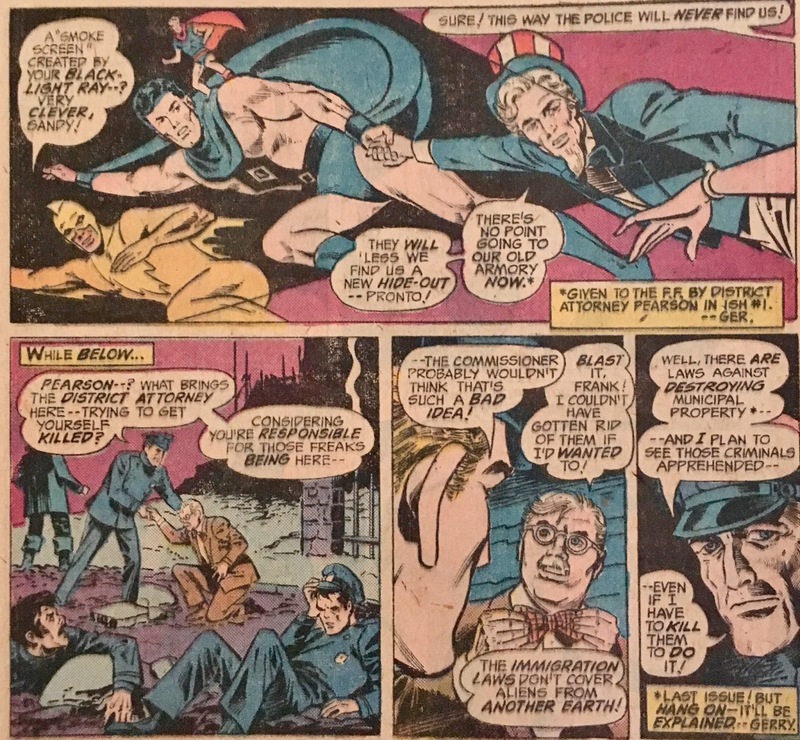 I could ask why the police didn't call in any of DC's heroes to try and take down the Fugitive Freedom Fighters, but the next issue blurb promises that Wonder Woman's going to show up... so, perhaps after this mix-up, they do? 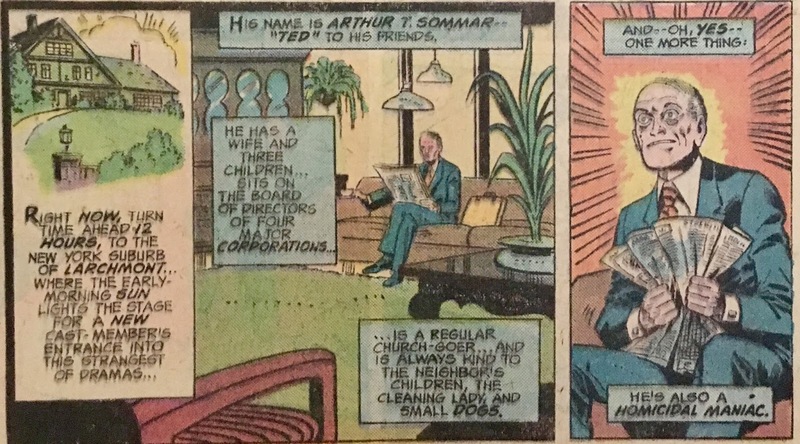 I wonder why so much went into Arthur/Ted's backstory. I mean, if the Qwardians were just going to transform a random passerby into Skragg, why did we need to know that dude is homicidal? Why did we need the scene of him bludgeoning his wife to death? Seems like they might've had bigger plans for ol' Mr. Sommar... hell, even the cover copy tells us we've never seen a villain as deadly as he is! Weird. The members of the Freedom Fighters don't come across as terribly engaging... though, to be fair, this really wasn't a character spotlight sort of issue. I think I can say that Uncle Sam's a pretty annoying character though. All those tarnations and consarnits... and wanting to go back to Earth-X... ay yai yai. That's something I can't wrap my head around... ya gotta figure most any Earth would be better than Earth-X, right? Overall, to wrap up... this is an issue that sorta feels like filler... it's not stunningly great or painfully awful... it just "is". Ramona Fradon's art is wonderful, her faces look pretty amazing. Not an issue I'd tell ya to rush out and find... or avoid if you come across it. It's books like this that are the hardest to discuss... just so middle-of-the-road, safe and inoffensive. Anyhoo, I hope y'all have a great day of barbecues, family and fireworks. Tomorrow's forecast is... brr, chilly. ..not to mention why his wife wanted to be dead. (i.e. "both of them had gotten what they always wanted." What a weird issue. I didn't even notice that! Weird, indeed! Interesting to see Qward return here and, yeah, this reads like it was originally intended to be a longer story told over multiple issues (but since Pasko only wrote #3&4 of Freedom Fighters, maybe the editor truncated the story ?). I bet you're onto something there! I didn't realize Pasko had such a short tenure on the title. It does seem like there were bigger plans for Skragg and the Qwardians to just write it all off so quickly. 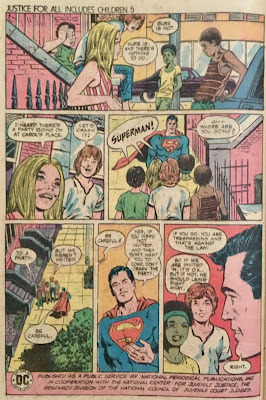 Terrible inks wreck Fradon's pencils here.